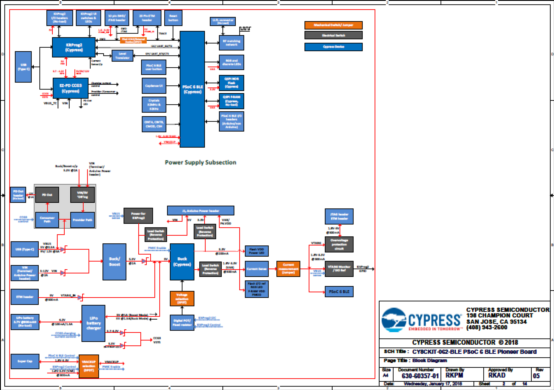 Cypress公司的PSoC 63 MCU系列是集成了Arm® Cortex™ CPU(单核和多核)的可升级和可配置的可编嵌入系统控制器,采用超低功耗40nm平台,包括有低功耗闪存和数字可编逻辑的双核微控制器(150-MHz Arm Cortex-M4F CPU和100-MHz Cortex M0+ CPU),高性能模数和数模转换器,低功耗比较器以及标准通信和定时外设,并提供BLE 5.0兼容的无线连接,可开发各种创新型物联网应用.主要用在可穿戴设备,个人医疗设备和无线音箱等.本文介绍了PSoC 63 MCU系列主要特性,框图,以及评估板CY8CKIT-062-BLE主要特性,框图和电路图. 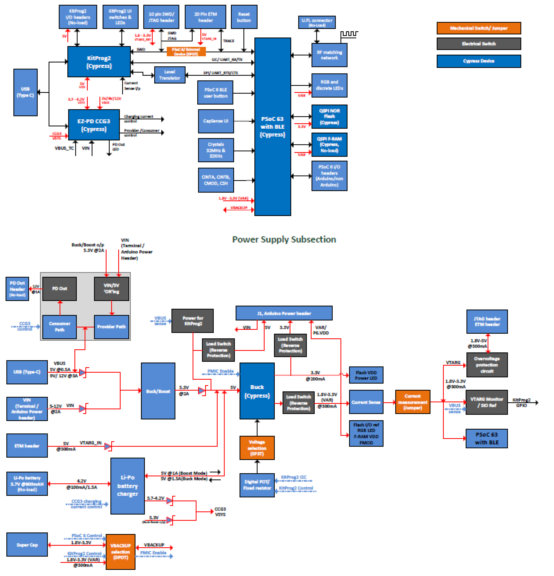 programmable embedded system controllers with Arm® Cortex™ CPUs (single and multi-core). The PSoC 63 product family, based on an ultra low-power 40-nm platform, is a combination of a dual-core microcontroller with low-power Flash technology and digital programmable logic, high-performance analog-to-digital and digital-to-analog conversion, low-power comparators, and standard communication and timing peripherals. The PSoC 63 family provides wireless connectivity with BLE 5.0 compliance. 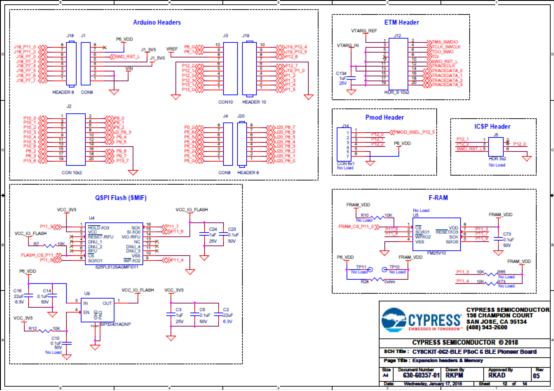 ■ 100-MHz Cortex M0+ CPU with single-cycle multiply and MPU. 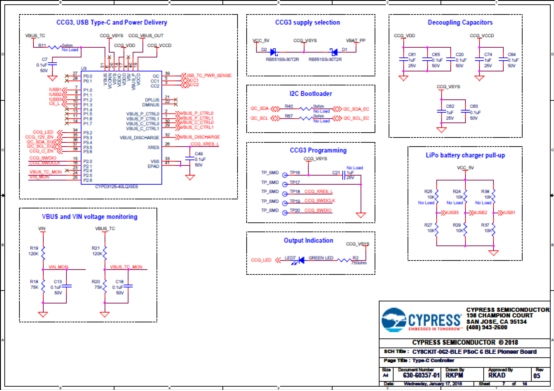 ■ Two low-power comparators that operate in Deep Sleep and Hibernate modes. 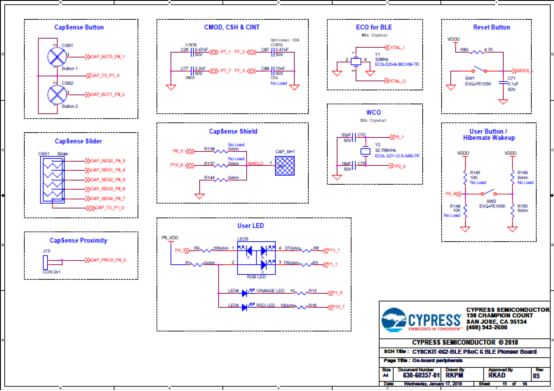 ■ Cypress-provided peripheral component library using UDBs to implement functions such as Communication peripherals (for example, LIN, UART, SPI, I2C, S/PDIF and other protocols), Waveform Generators, Pseudo-Random Sequence (PRS) generation, and many other functions. 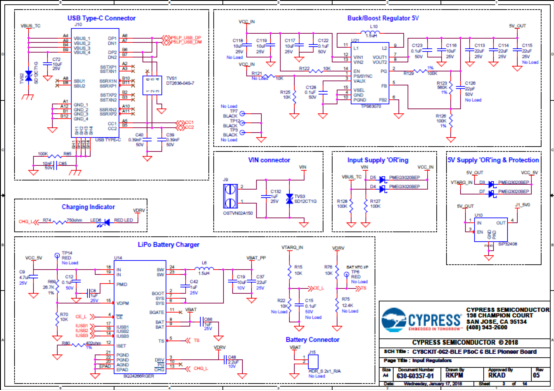 Thank you for your interest in the CY8CKIT-062-BLE PSoC 6 BLE Pioneer Kit. 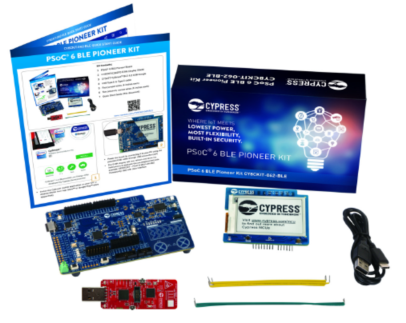 The PSoC 6 BLE Pioneer Kit enables you to evaluate and develop your applications using the PSoC 6 MCU with Bluetooth Low Energy (BLE) Connectivity (hereafter called “PSoC 6 MCU”). 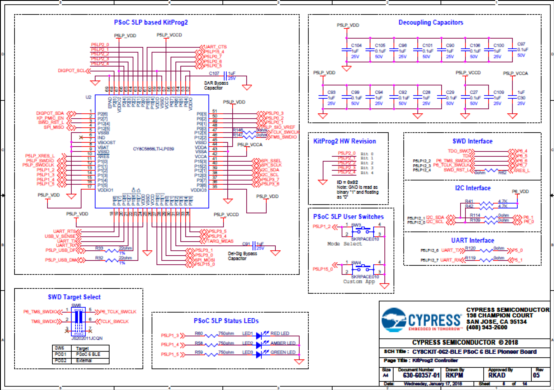 PSoC 6 MCU is Cypress’ latest, ultra-low-power PSoC specifically designed for wearables and IoT products. PSoC 6 MCU is a true programmable embedded system-on-chip, integrating a 150-MHz ARM® Cortex®-M4 as the primary application processor, a 100-MHz ARM Cortex®-M0+ that supports low-power operations, up to 1 MB Flash and 288 KB SRAM, an integrated BLE 4.2 radio, CapSense® touch-sensing, and programmable analog and digital peripherals that allow higher flexibility, in-field tuning of the design, and faster time-to-market. 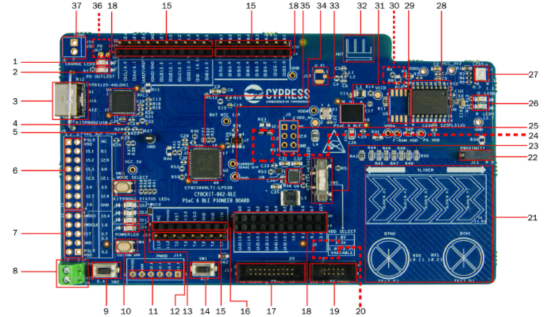 The PSoC 6 BLE Pioneer board offers compatibility with Arduino™ shields. 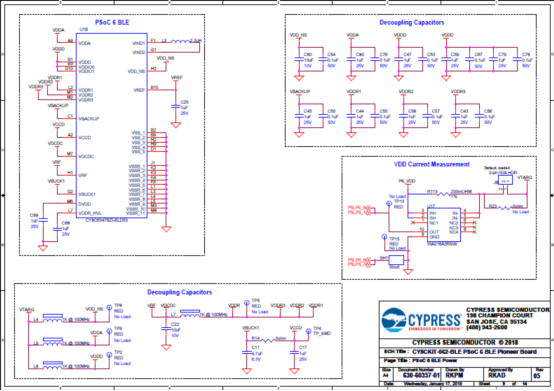 The board features a PSoC 6 MCU, a 512-Mb NOR flash, onboard programmer/debugger (KitProg2), USB Type-C power delivery system (EZ-PD™ CCG3), 5-segment CapSense slider, two CapSense buttons, one Cap-Sense proximity sensing header, an RGB LED, two user LEDs, and one push button. 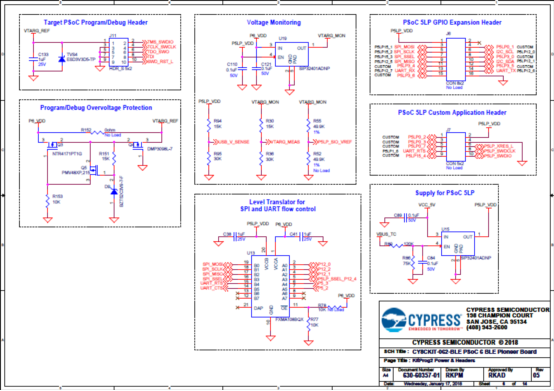 The board supports operating voltages from 1.8 V to 3.3 V for PSoC 6 MCU. 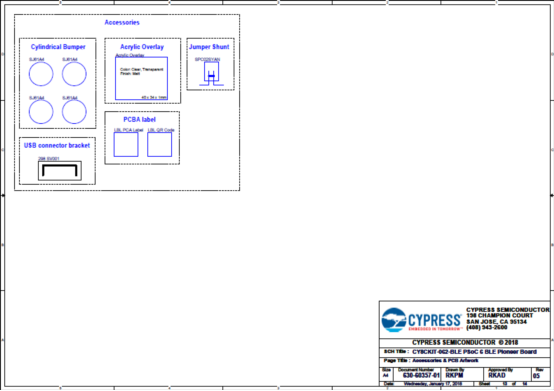 The CY8CKIT-062-BLE package includes a CY8CKIT-028-EPD E-INK Display Shield that contains a 2.7-inch E-INK display, a motion sensor, a thermistor, and a PDM microphone. 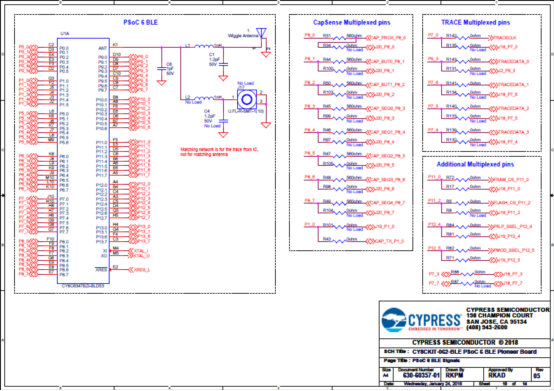 The kit package also contains a CY5677 CySmart BLE 4.2 USB Dongle that is factory-programmed to emulate a BLE GAP Central device, enabling you to emulate a BLE host on your computer. You can use PSoC Creator™ to develop and debug your PSoC 6 MCU projects. 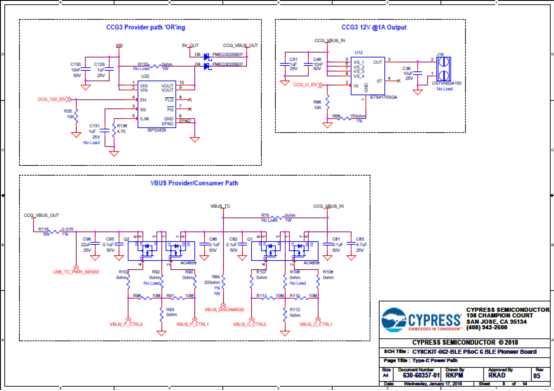 PSoC Creator is Cypress’ standard integrated design environment (IDE). 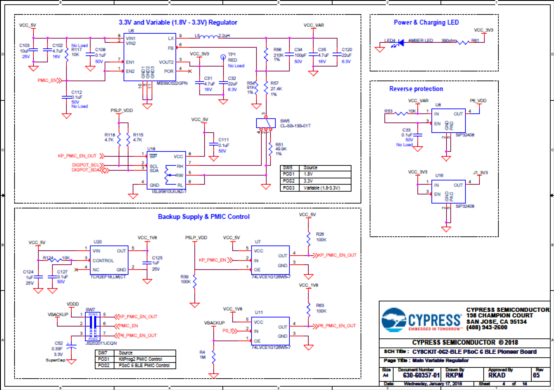 PSoC Creator also supports exporting your designs to other third party firmware development tools. If you are new to PSoC 6 MCU and PSoC Creator IDE, you can find introductions in the application note AN210781 - Getting Started with PSoC 6 MCU with Bluetooth Low Energy (BLE) Connectivity. 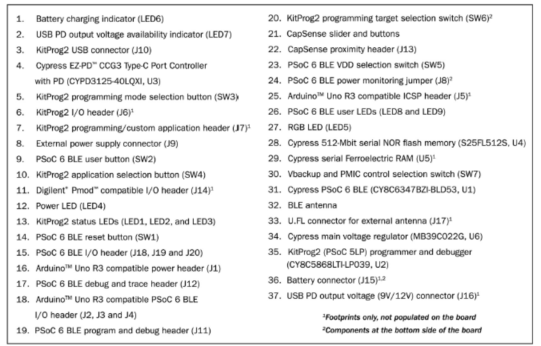 The CY8CKIT-062-BLE package has the following contents.